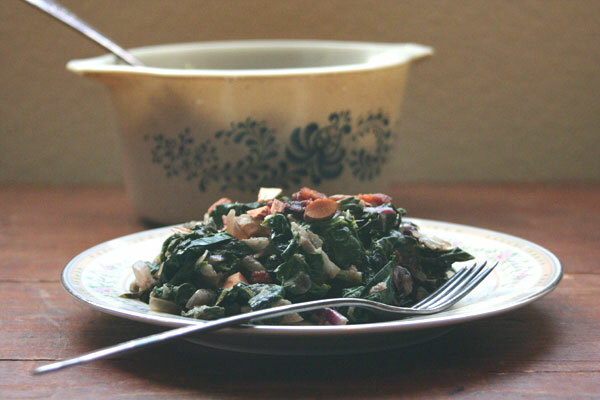 When I was young, like the year I got my Cabbage Patch Kid for Christmas, I think I would have made a really weird face at you, had you promised that I would somday love things like spinach, kale, radicchio, and swiss chard. Or, I may have ignored you altogether and continued to play with my doll. But now, 26 or so years later. I do. 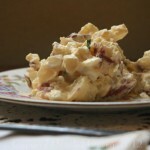 I love them as a salad, in scrambled eggs, with fried potatoes, and maybe best of all, wilted, wilted, wilted down, then topped with some crispy bacon and crunchy almonds… I might not want to share (yes, sometimes I am still a bit like my 5 year old self). For this week’s episode, I was trying to think of something you might have wanted to try, but haven’t had the courage to. Something that’s simple, yet seems a bit intimidating. Perfect for episode 47, for a cold fall – almost winter’s dinner. If you’ve looked at the recipe already, you will see that not only are there tons of weird greens (weird if they’re new to you maybe), but also a wacky Black Spanish Radish. Radishes add a spicy kick that (especially when grated) isn’t overpowering. They’re richÃ‚ in absorbic acid, folic acid, amd potassium. They’re a good source of vitamin B6, riboflavin, magnesium, copper, and calcium. (1) In addition to grating radishes into salads (wilted or regular), I use them in soups, stews, salads, and stir fries… among many other things. So now that we’ve got that settled, eat along friends! Let’s wilt some greens! Last modified on 2013-09-05 17:44:08 GMT. 0 comments. Top. I just love Wilted Greens! 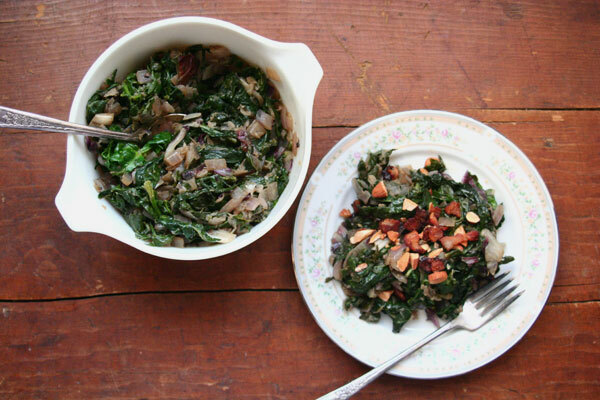 Beautiful kale, spinach, and radicchio are wilted down, some onions and Spanish black radishes are sautÃƒ©ed, then it’s all topped with crispy bacon and crunchy almonds. 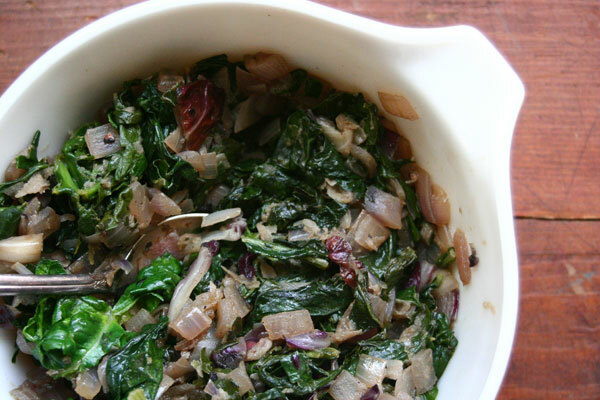 A perfect side dish! Place bacon in cold pan, cook until crispy. Remove with slotted spoon and set on a paper towel to drain. Either discard bacon grease from pan and add 2 T olive oil, or leave about 1 T bacon grease and add 1 T olive oil. Heat and add onion and radish. Cook 3-5 minutes, or until softened, over medium heat. Remove stems from greens, wash well, and dry. Add vinegar, maple syrup, dijon, and seasonings to the onion pan. Stir, then add all the radicchio and some of the greens, wilting down and tossing, then adding more greens and repeating until they are all gone. Turn the heat down to medium-low. Once all greens are wilted, taste and adjust seasoning if needed. 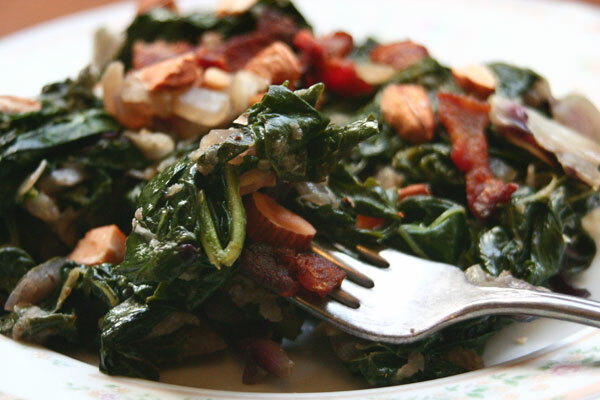 Serve topped with bacon and almonds. 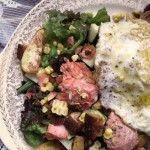 This dish can be found on Tuesday of this week’s menu!